Okay, It's Not A Quad, But What A Deal! Discussion in 'Off Topic' started by GlassKnees, Apr 3, 2018. Heard of the Parrot Disco? It is a flying wing that has some pretty cool features, but many were put off by the price. But since DJI has dominated the industry, Parrot became one of the casualties, and has discontinued the Disco. But there are vendors out there that have Discos in stock and are selling them at huge discounts. For example, B&H Photo & Video is selling them for $399 - I just bought one for myself. Jackson and Spork like this. ... Did he say 45 minutes flight time ?! THAT part I like, the $400 price tag for a "Foamy" not so much. 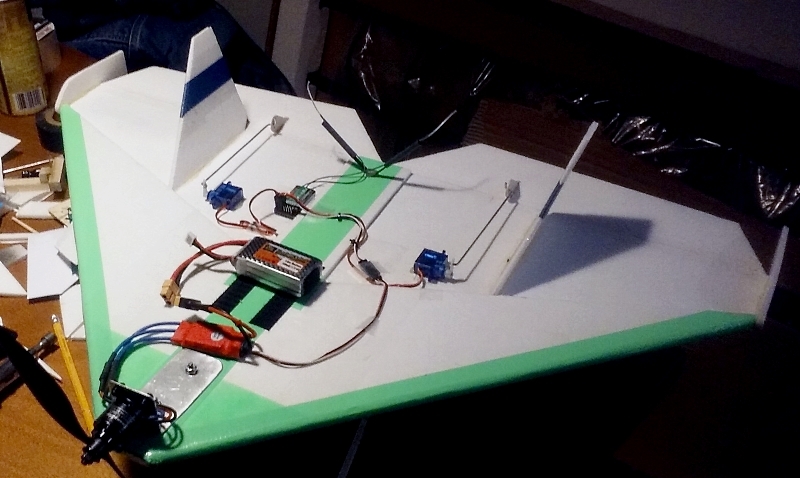 Back when I flew RC planes I used to make foamies and wing cores with my own "hot wire" set up. That looks pretty cool, GlassKnees. Did you fly it like you stole it? Yeah, it is a foamy, but there isa lot of tech in it as well - flight controller, gimbal withcamera, etc. "Hot wire", in this use of the term though, is a long taught piece of nichrome wire with voltage going through it so it heats up. It's suspended by supports and is used like a knife for slicing through broad sections of blocks and slabs of styrofoam when making your own wings. Spork and GlassKnees like this. Gotcha thanks for that explanation. I’ll bet. When I told my dad about getting into drones he told me how he bought an RC plane back in the day but was too afraid to wreck it while learning to fly so he sold it to a friend before he had any fun with it. My delta wing built with Dollar Tree foam board. It was just too damn fast, finally smartened up and got a 2S battery for it. It's kinda hard to see but the leading edge of the wing has another layer of foam board on top (~50% coverage) creating a KM airfoil. Went through a lot of props getting the angle of the aluminum motor mount right and the location of the battery (COG,) I should have made a pusher. With no rudder, this is the quintessential 'yank and back' plane. Should have built a ruddered slow fly instead. KentA, Gyro Doctor and Spork like this. With no rudder, this is the quintessential 'yank and back' plane. Love it ... I also made a delta like that (without rudders), so I'm very familiar with "Yank and Bank" too. Impressive performance on that video ... Reminds me of a P51 Mustang I made that I could "Hang from the Prop" like that. It used an Enya gas motor though, so there was no reversing out of nose down attitudes like he did. The little thingy on the of the nose in front of the Parrot logo is the power switch and also the pitot tube. The camera is fixed and tilt and stabilization is done via software. The propeller folds to prevent damage during landing - there is a sensor on the bottom that detects the ground and shuts down the motor during landing. Put the iPhone in the holder and slide it into the googles, plug the iPhone into the controller and launch the app - you can put the phone into split screen mode so each eye sees the display - don't know if there's any offset to give you a 3D effect, which would be cool. I've downloaded the firmware updates. Also, I had to go through a "calibration" of the controller - move it around the pitch, roll, yaw axis, which is kinda weird. I will also have to do the same with the aircraft. The only thing keeping me from taking it out for a spin is the lipo has an XT60 connector and I don't have one on my charger. I ordered a charging cable from Amazon and it should arrive tomorrow (Monday), but the weather is going to turn crappy - won't get a change to fly until Friday if the weather forecasts are accurate. I am so looking forward to trying this out! KentA and Spork like this. Gyro Doctor and KentA like this. I looks like you're having fun.